I had some delicious sauce left over from Sunday, so today I decided to make Inside-Out Ravioli. My mom started making these many years ago when we still lived in St. Louis, and if I remember correctly, she had cut the recipe out of a Philadelphia newspaper before we moved to the Midwest from Philly. This was a special occasion meal, but since I have been cooking for just two, I have been preparing meals that were once "special" because they took a long time to prepare. But when you are just cooking for a few, they really are not that time consuming to make! I have also discovered that this dish has Tuscan roots! The original name for these ricotta and spinach dumplings - essentially the filling for ravioli, hence the name in English - is "Ignudi" which, in Italian, means "naked"! The perfect name for this delicious dish! 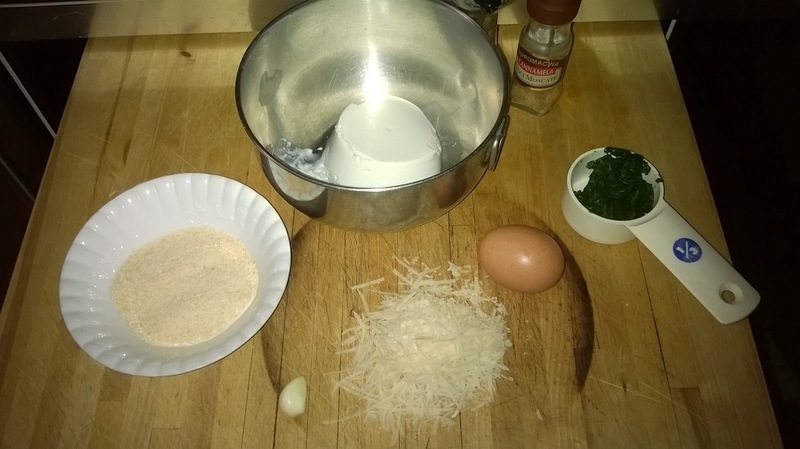 In a medium bowl, mix together all ingredients except for the bread crumbs and flour. Mix well, add the breadcrumbs. Now you will have to let the mixture sit for about 20 minutes so the breadcrumbs have time to absorb the liquid in the mixture. 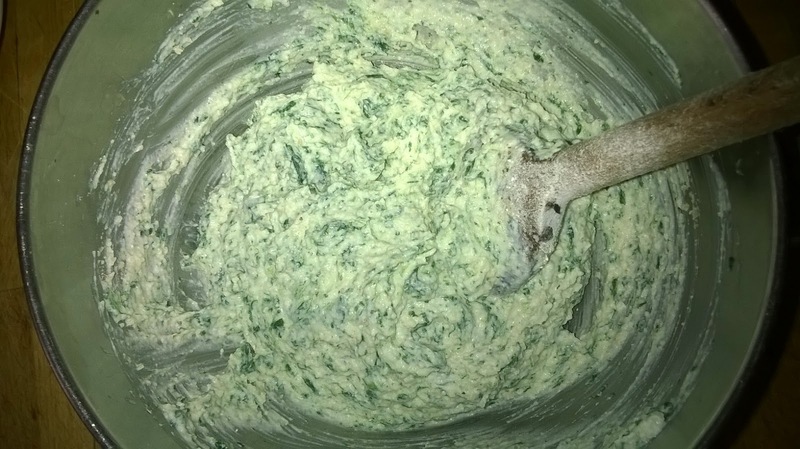 It should be thick enough, so that when you drop a tablespoon of the mix into a bowl of flour, it holds its shape and can be handled delicately with the fingers to form a cylinder. If, after 20 minutes, it has not reached this consistency you can add a little bit of flour. 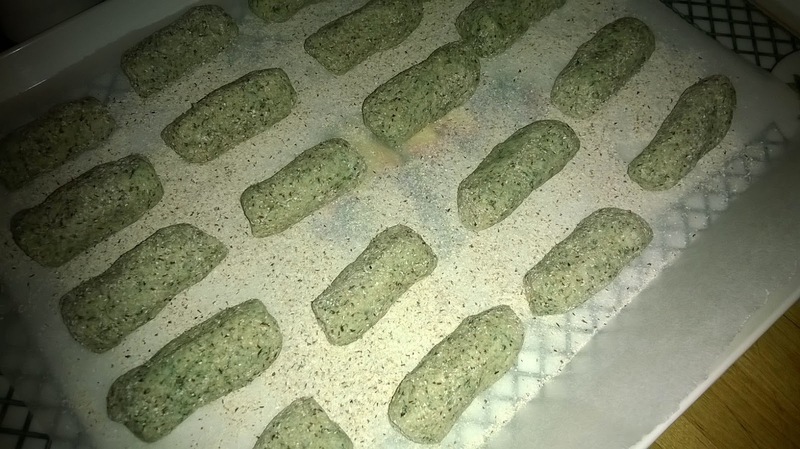 Don't go heavy on the flour or your "ignudi" will be heavy. Start with 1 tablespoon, wait 10 minutes and then test the mixture again. 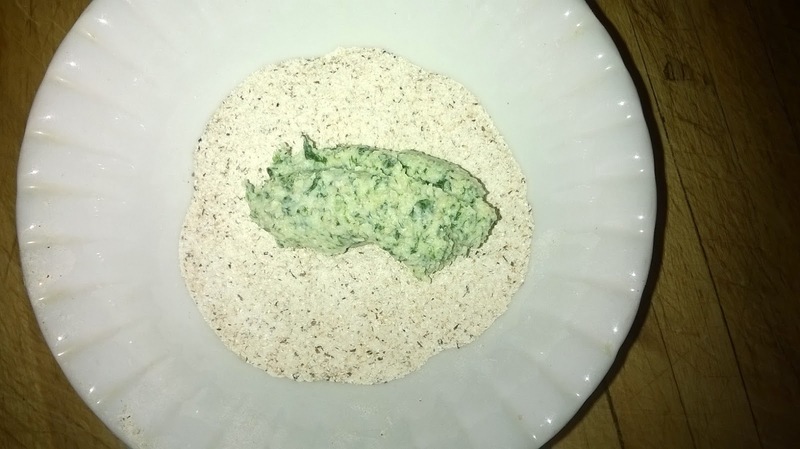 To form the "ignudi" drop by tablespoon full into a small dish of flour. Delicately turn the portion of mixture in the flour to coat it and then form it into a cylinder. 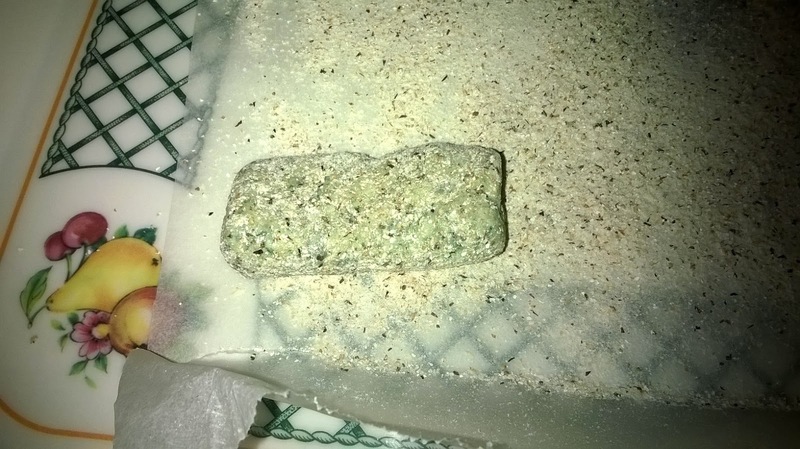 Roll it in the flour and place on a wax-paper lined cookie sheet. I generally get about 20 "ignudi" from this recipe. Set aside at room temperature if you are going to cook them within 30 minutes. Otherwise, cover and refrigerate for up to 24 hours. Do not freeze raw. The ricotta gets watery and the "ignudi" will fall apart when you go to cook them after freezing. You can freeze them after they are cooked. To cook the "ignudi", bring about 2 inches of water to boil in a large frying pan. It should not be a full rolling boil. Salt the water and cook the "ignudi" about 10 at a time using a slotted spoon to turn them frequently during cooking. They should cook about 1 minute if room temperature, 2-3 minutes if refrigerated. Remove them from the water with a slotted spoon allowing them to drain well from the spoon before transferring them to a warmed serving dish. When all of the "ignudi" are cooked, season with tomato sauce and grated parmigiano cheese. You can also season them with melted butter and grated cheese and put them under the broiler for a minute or two for "Ignudi Au Gratin".